While you can simply plop an egg in a muffin cup and call it breakfast, you can color outside the lines a little or a lot, both before and after baking. Line the muffin cup with Canadian bacon. Plop scrambled eggs into the muffin cup in place of a raw unscrambled egg. Dribble with hollandaise. Make your own egg and cheese muffin sandwich. Portion your go-to quiche into these for appetizers. We dare you to conjure something to do with these huevos that we—or our hundreds of recipe testers—haven’t tried. Go on. Let us know in a comment below. 1. Position the rack in the middle of the oven and preheat the oven to 350°F (177°C). Generously coat 6 cups in a standard-size nonstick muffin tin with an obscene amount of oil or butter. 2. Carefully crack 1 egg into each muffin cup. (If you insist on intact yolks but can’t handle the pressure of having to crack the egg without breaking the yolk, first crack each egg into a small dish or coffee cup instead and pour it into the tin. If you break the yolk, just try it again.) Sprinkle the eggs with the bacon and slide the pan into the oven. Rotate the pan after 5 to 6 minutes, or when the egg whites begin to turn opaque, to ensure the eggs bake evenly. Bake until the whites are set and the yolks look partially set and a little jiggly, 8 to 15 minutes total, depending on how you like your eggs. (If you like your yolks runny, think 8 to 12 minutes; if you like your yolks some degree of hard-cooked, think 12 or more minutes.) Don’t worry if the tops of the eggs don’t look completely done, as the eggs will continue to cook while resting. The appearance is deceptive because the bottoms of the eggs cook faster than the tops. 3. Remove the tin from the oven and sprinkle the baked eggs with Parmesan, if desired. Let them cool slightly before removing them from the tin, using a knife to loosen the eggs from the edge of the tin. Sprinkle with salt and pepper to taste. This baked eggs recipe is easy, foolproof, and delicious. This has got to be the easiest method to make perfect eggs for breakfast, lunch, or dinner. I've made this recipe 3 times in the past 10 days. I could only find a silicone muffin tin to use, and I've found a very light swipe with a little bit of butter was best. The best part is the eggs are perfectly cooked with a soft but not runny yolk. It's like having bacon and eggs to go. I cooked them for 7 minutes and then, after rotating the tray, for 6 minutes more. The next time I cooked them for 7 minutes before and after rotating and found the yolks were closer to hard-boiled without the peeling. The third time I left out the bacon, added an herb blend, and then a grating of a hard goat cheese. Heaven! I think that for a really soft yolk, baking them for no more than 10 minutes should do the trick, as 12 minutes gave a nice soft yolk and a fully cooked white. There's just so many different things you could add to these eggs that they could be different every day of the week. This recipe could also be a good way to make eggs for other recipes while getting the rest of the recipe ready instead of frying or poaching. This baked eggs recipe is a perfect solution for a quick and easy breakfast and makes a beautiful presentation. I was also very interested in trying these baked eggs so I could make a large batch of eggs at once for when we have guests for breakfast. The first time I tried this, I made only 4 eggs for my husband and myself. They turned out perfect! I like more of a "runnier" yolk, so 8 minutes of baking was perfect for me. It's important to rotate the pan after 5 minutes for even baking. I let the eggs rest for about 2 minutes so the egg whites set, and that helped keep a nice shape when removing them from the muffin tin. I ran a clean butter knife around and under each egg and gently removed them to place on each plate. Very easy to do. The baked eggs had a nice shape when taken out of the tin, and the egg white was nice and firm with a gently runny yolk. The eggs were similar to an "over easy" egg. The bacon bits added a very nice bacon flavor, as well as a yummy smell while baking. I sprinkled sea salt and cracked pepper, did not add any cheese, and served with buttered toast. No messy stove or skillet to clean, and great for a large group of people. Total time was a mere 13 minutes! Next time I am going to add some hollandaise sauce over the eggs–a very good way to serve eggs Benedict in a pinch! These are fun little guys to make! This baked eggs recipe was simple, easy to follow, and a nice way to feed a crowd. There wasn't anything particularly special about it, but the ease of creation overcame the relatively ordinary presentation. I loved it as a basis to do many things. I tried it as a quick way to make eggs Benedict for 4, leaving off the bacon since I used Canadian bacon with the muffins. I also used leftover sautéed spinach as a base and topped it with a baked egg, a slice of bacon, and a drizzle of butter tarragon sauce—that was the biggest hit. I also found it to be an easy and attractive way to present breakfast to more than 2 people while letting my imagination create the rest of the menu. As a stand-alone recipe, it was fine, though perhaps it requires a little tweaking to make it more interesting. But it was very simple and foolproof. Wow–you did it! You invited 10 friendly souls to brunch this Sunday and now what do you do? If you grew up in NOLA, you KNOW whatever it is will involve Bloodies and Milk Punch and EGGS! Yes, eggs. So, how are you going to get a dozen eggs all done at the same time for this feast? Fear not, my friend! This baked eggs recipe is basic, foolproof, easy, quick, reliable, and all those things your other methods are not. Just follow the directions, and you will get stellar results. I used butter so as to make the eggs happy, but some sesame oil instead might also be nice. After you butter or oil the muffin tin, crack the eggs right into the tin and place it on the middle shelf in the oven, and you are home free. Yes, it does say large eggs, but have you ever opened the carton and wondered if 2 different people were packing those eggs? I definitely had a few extra large eggs and one jumbo one. I just picked 6 that looked about the same size and went with them. I didn't put bacon on top of the eggs, as I was heading in a direction that didn't need bacon (is there such a place? ), but I did sprinkle some Parmesan on top as they came out of the oven. Removing the eggs from the tins can be tricky if you aren't brave. Don't hesitate—just run that knife around the edges and out they come. Baking the eggs this way gives them all the same size and shape so you can really plate them up in a host of different ways—on fried grits, on regular grits, on a flakey biscuit, on an English muffin, on toast, on a sausage patty, on top of a nice arugula salad if you like. Really, just have a blast with these, because now you're freed up to make that hollandaise, salsa, or just hustle another Bloody or Milk Punch off the tray as it goes around to your guests! Just when I think I've seen it all with eggs, you come up with a way to bake them in a muffin tin. Though this baked eggs recipe isn't going to transform the way eggs taste, it is going to change the way you cook eggs for a group of people–forever. First, it's so gosh darn easy, I did it without my morning coffee (and that is a major feat, let me tell you). Second, the results are adorable. Have you thought of eggs as adorable lately? No? It's about time you did. Third, it makes cooking a large amount of eggs at a time a cinch. Last, the results are perfect—slightly runny on the outside, perfectly cooked everywhere else. My only suggestion would be to add the Parmesan a minute before you plan on removing the tin from the oven to let the cheese get all melty and gooey. But why stop at Parmesan? The possibilities are endless for a delightful breakfast. This was fast, fast, fast. Not that eggs usually take very long, but I was amazed at how quick it was, as well as how little clean up it required. Great recipe for brunch. I rotated the pan after 6 minutes, and pulled the eggs 7 minutes later as they didn't move when I shook the tin. It's a little hard to tell if the yolk is partially set, as my whites cooked over the yolk and I couldn't see it. This baked eggs recipe is a simple, easy, and quick way to get breakfast on the table for a group of people. For our little family, I used coconut oil spray for the muffin cups and cooked 3 large eggs for 9 to 10 minutes. I added salt to the eggs before they were cooked and pepper once they were removed from the oven. We prefer our bacon very crisp so I baked that separately and served alongside. My son loved squishing his baked egg between two pieces of toast as a sandwich! This baked eggs recipe was really easy and delicious. Rather than using vegetable oil or butter, I used spray oil and sprayed the muffin cups twice. The timing for cooking at 10 minutes was perfect. It only needed about 2 minutes or so to cool. I may try this recipe again with individual ramekins. What a quick, easy, and elegant way to enjoy eggs! I love the presentation—and taste–of these baked eggs. The recipe is basic but full of flavor and truly is a blank slate for whatever accompaniments you choose to add. I used bacon and Parmesan, but I think chopped fresh parsley or chives would be a welcome addition, or maybe even some chopped mushrooms, diced tomatoes, or cubed ham. This recipe would be a lovely dish to serve on a brunch buffet or to houseguests. I love eggs every which way, but I rarely bake them since I’m usually cooking them only for myself or maybe a couple of others. But I was asked to make some scones for a morning meeting at school, and since I had the oven on, I decided to add these baked eggs to the menu. Clearly, this isn’t so much a recipe as it is instructions on timing, and with eggs, timing is everything. With this recipe, the timing is just about right. Of course, a wide range is given so you do have to keep an eye on things, but this technique works beautifully if you’re making eggs for a crowd. I made a dozen baked eggs and wanted to serve them easily so I baked them in small ramekins instead of a muffin tin. I used the bacon and cheese and highly recommend both. It took longer to read the instructions than to put the eggs together. It reminded me how simple baking eggs can be. I removed the pan just before the eggs looked fully set. By the time I served them a minute or two later, they were perfectly cooked. I served them in the ramekins to speed things up for the meeting, but I did try removing one and it slide right out. Still, I think it’s just as easy to bake and serve them in the ramekins and you eliminate the risk of breaking the still-runny yolk on its way to a plate. Egg, bacon, cheese. Hard to go wrong. My meeting colleagues were all very happy. These baked eggs are fun and easy to make. My mom bought ground bacon from our beloved local butcher, and we fried it and sprinkled that on top. The eggs were delicious. What an easy way to have eggs ready for a crowd! This baked eggs recipe serves 6 but can easily be modified for more or less. My family members are big bacon fans so next time I would at least double the amount of bacon. I used a dark nonstick muffin tin and cooked them for 10 minutes. This yielded soft-cooked eggs without any runny center. The Parmesan was a nice addition, but the eggs were good without it, too. I will definitely make these again! 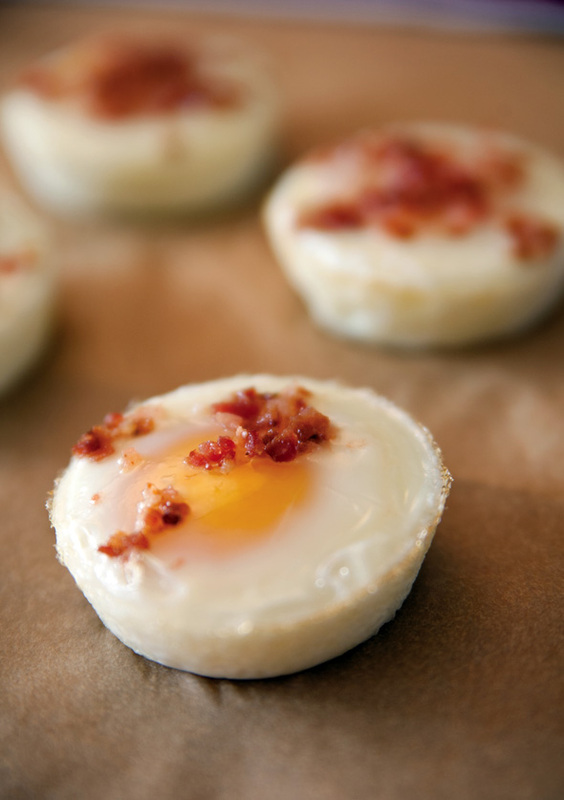 Eggs baked in a muffin pan—who would’ve thought? I loved the idea, and it was super easy. I would emphasize the “thoroughly coat” the cups with oil or butter. I used butter, and obviously it wasn’t enough, as the pan was really hard to clean. It’s really old, and I didn’t care, but I wonder if anyone used silicone pans. Or would paper muffin cups work? I cracked the eggs into the tin and topped with bacon. I forgot to use the Parmesan, but I bet it would’ve been great! I loosened the eggs and turned them out. They were cute little cup-shaped baked eggs! This recipe has a lot of potential, as it can be topped with various meats and cheeses. You can have it prepped and ready to pop in the oven if you have a group for breakfast or brunch. And the presentation is fun! What a great way to cook eggs. The method is simple, works as written, and produces an egg that has great eye-appeal. I accidentally sprinkled some Parmesan and bacon on the eggs before I baked them. They tasted amazing, like so much more than a single egg. These would be wonderful for eggs Benedict or an egg sandwich. On their own or with some accompaniment, these eggs are truly wonderful. I used butter to coat my muffin tin, and I let the eggs sit for about 5 minutes before removing them from the tin. The eggs released easily and tasted great. This baked eggs recipe is basic but so good! Very often we will have scrambled or fried eggs for a light supper, but this is so much better. The slower cooking of the eggs with the bacon makes for a comfort food taste and feel. I cooked the bacon to a nice crispness so there is a little crunch with each bite. I did use the Parmesan and actually sprinkled it on the eggs a couple of minutes before removing them from the oven. I used a liberal dash of salt and pepper to finish it off. This, along with toasted ciabatta and a glass of white wine, makes a perfect supper. Basic is not a bad thing. In fact, at times, it's the best way to go. These baked eggs were perfect. They were cooked to our preference in 10 minutes, though we like our yolks almost set. The whites were perfectly cooked without turning rubbery and the yolks were firm, with creamy middles. If you want runnier eggs, be sure to check them after about 7 minutes. And trust that they really do continue to cook during their rest time. We skipped the bacon in favor of eating our strips beside our eggs. We did increase the Parmesan we sprinkled on top, using almost a tablespoon per egg. It was very nice to be able to bake the eggs without having to babysit them. I will definitely be baking eggs more often in the future. Our son only eats scrambled eggs. The baking method worked perfectly for his eggs, though they did not need the rest time. They even puffed like little soufflés. If you decide to go the scrambled route, the eggs definitely only take about 7 minutes to bake and they don’t need any rest time in the hot pan. A dozen different egg meals, each uniquely flavored, made in a single dish! Translation: Like a restaurant, you can create unique egg dishes for your family or guests with only a muffin tin to clean. Make additional egg cups to freeze for a quick, delish protein bite on the run! I used a 12-tin muffin pan and followed the recipe as written for a couple of the egg cups. I added various combination of fresh herbs (marjoram, rosemary, thyme, oregano, and basil) along with a 4-cheese blend to the remaining muffin cups. Herbs added brightness and flavor while the recipe as written is a terrific base recipe. Other great variations: "migas-style" baked egg cup with chorizo, tortilla chips, and a garnish of salsa, cilantro, and diced avocado; "Sriracha chili pepper" egg cup garnished with scallion or sliced asparagus tips; "veggie delight" egg cup with sliced zucchini, baby or summer squash, mushrooms, leeks, scallions, sautéed chard, spinach, kale, and made "omelette-style" utilizing beaten eggs. Flavor and texture combinations are numerous; substitute bacon with chicken, pork, brisket, steak, or Italian sausage. A plethora of cheese substations exist along with garnishes. I found that 1 slice crumbled bacon per cup provided a good egg-to-bacon ratio for our family. I'm glad to have found such a great, simple, highly adaptable recipe! I chose to make this baked eggs recipe because of its simplicity and convenience. If you have a group for breakfast, it frees up your time so you can make toast and other sides to be served with the eggs. As the recipe states, 10 to 15 minutes TOTAL. Because eggs really range in size, you want to keep a close eye on them so they don't overcook. That said, try to make sure all of your eggs are close in size. I prefer organic, cage-free eggs and the sizes range significantly. The bacon is a wonderful addition (when isn't it? ), but for the vegetarian, the sprinkle of Parmesan give them an extra boost, so don't skip that step. Perfect for a small crowd. I love how adaptable this simple baked eggs recipe can be, especially when trying to accommodate a variety of palates within a household. I stuck to the basic recipe for half of these and used some diced maple ham for the other half. I think crumbled cooked chorizo or milder pork sausage would also work well here, too. I don't like runny yolks, and these eggs turned out perfectly after being in the oven for 14 minutes and then being allowed to rest. If you like them runny, I think 11 to 12 minutes would have been fine. Really liked how hands-off these were, and think they'd be a great addition to a brunch menu for a party. What I love about this baked eggs recipe is that since going gluten-free, one thing I've been missing is my guilty pleasure: McDonald's Egg McMuffins. I know, I know, so bad, but what a fun little treat from time to time. Well, this recipe can be very versatile, whether you want to add cheese or bacon bits or a whole slice Canadian bacon. We tried it both sandwiched with bread and on its own and wow! What a great comforting snack or breakfast. Great both for weekday mornings, as it really doesn't take too long, or as a brunch idea for weekends. I've made these baked eggs a few times, each time adding a different topping. One thing to keep an eye on is the timing, as it's very easy to overcook your eggs. Until you get a good idea of the perfect time given your oven, keep a keen eye on them. I've poached, scrambled, and fried eggs, but I've never thought to drop them into muffin tins and bake them whole. GENIUS! This technique couldn't have been simpler. I didn't use the bacon or the cheese—I simply used silicone cups which I didn't have to oil and then broke the whole eggs into each cup. What a cool trick! Baked Eggs Recipe © 2013 Biju Thomas and Allen Lim. Photo © 2013 Courtesy VeloPress. All rights reserved. All recipes and photos used with permission of the publisher. The recipe should call for 4 slices of bacon because you know you’re going to eat a couple while putting the rest of the recipe together. Brilliant idea—the perfect way to make Eggs Benedict for a crowd. Seriously. 30 years in the kitchen and I’ve never thought of this. You just made brunch easy. Terrific to hear, Arika! And don’t beat yourself up. None of us had thought of this nifty trick, either. Laura, so glad you like the recipe. And having a husband make breakfast for you is a pretty darn good thing! I know that this is an old thread, but am hoping that some will still see this post. I just tried this this morning and I’m not sure what I am doing wrong. I made them with (cold) margarine and only with cooking spray–all with a dark metal muffin tin. I tried margarine 8 minutes and 2 mins resting on stove with and without a cover, extended cooking time up to 10 mins with resting they still had uncooked whites on top. Finally I used cooking spray for 10 mins– still runny white on top. Last one was in for 15-16 mins (w/cooking spray). Whites were done, but the yolk was fully cooked. All in a preheated 350 oven, oven is brand new pretty nice model so power shouldn’t be an issue. I am trying to have the white on top fully cooked with the yolk fully runny. I am wondering if I need to be covering them while in the oven or what? Any help would be greatly appreciated! Oh, and I’m only making about 1 or 2 at a time and not putting anything on top other than salt and pepper. Marcia, Happy New Year! I have to say that in my experience, achieving cooked eggs with the whites fully set and the yolks completely runny is tricky no matter how one cooks eggs! That said, let’s look at each component of this recipe. I just want to doublecheck that you’re using standard size muffin tins? And are you using large eggs? Are you rotating the pan during cooking as the recipe instructs for even cooking? Where is your oven rack situated—top, middle, or bottom? As for the type of fat you use, to be honest, I don’t think that’s going to impact how quickly the eggs cook. I cannot emphasize enough that it’s very important to follow the recipe as written—do not cover the eggs during baking and, as we mention, the longer you bake the eggs, the more fully cooked your yolks are going to be, so you want to take the pan out of the oven after 8 minutes for runny yolks, just like we suggest in the recipe. If covering the eggs after you take them out of the oven doesn’t help the egg whites fully set, then may I recommend that you take the baked eggs out of the oven, adjust the oven rack to be far from the broiler burner, and then put the baked eggs under the broiler just long enough to set the top of the egg whites? Try separating the eggs. Bake the whites till almost done, then gently place the yolks on top and bake till your preferred doneness. Thanks so much for joining the conversation, Joy!